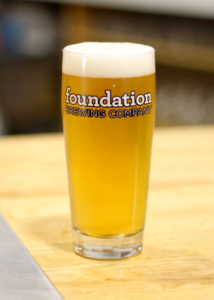 We have tapped our first kegs of a beer that is in a bit of a different direction for us at Foundation Brewing Company. Our brewers have been really excited to make this, and have been patiently waiting for its release. We are now pouring our first production size batch of a lager, a German style Helles. Helles is German for “Light,” referring to the bright golden color of the beer, certainly not the taste. First brewed in Bavaria as a response to the success of pilsners, Helles is the beer you will most likely see the locals quaffing if you are traveling around Munich. To keep with tradition, we brewed ours with 100% German malts and hops, and a traditional German Lager strain. The resulting beer is an amazing balance of rich, bready malt and delicate, spicy hops. This is the type of beer that just seems to disappear in a satisfying, effortless way. Our Helles will be available at the brewery for samples, as growlers and howlers to go, and a limited amount will be going out as draft to distribution. Don’t wait too long, or our staff will drink it all before you get a chance!